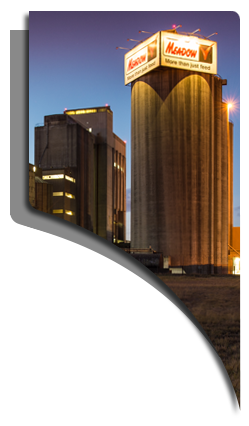 Our People: proudly drive Meadow Feeds’ vision to deliver more than just feed throughout Southern Africa. A culture of hard work and respect for ethical business practices and good governance is clearly evident throughout our organisation. Our Pedigree: Since 1942 Meadow Feeds has been supplying safe, high quality feed to Southern African livestock producers, using our unrivaled experience and expertise to earn the trust of generations of farmers who bring wholesome meat, milk and eggs to your table. Our Passion: for animal nutrition has made us the largest feed company in Africa and the leading supplier of innovative high performance feed solutions. Our Purpose: is to scientifically, and cost effectively, meet the requirements of modern farm animals, which require a finely balanced and expertly manufactured feed to perform to their genetic potential. Research and Development: Meadow Feeds has technical agreements with the world’s leading animal nutrition companies including Provimi, Neutron and Cargill to ensure that we stay abreast of the latest global developments in animal feed. Formulation: Meadow Feeds’ nutritionists use the world’s foremost formulation software to optimise least cost, balanced animal diets at a nutrient rather than a raw material level. Raw materials: Our raw materials are sourced from accredited and rigorously approved suppliers whom have partnered with Meadow Feeds to reduce risk and ensure consistent quality from source. All raw materials are analysed prior to receipt using Near Infra-red Spectrophotometry to ensure that the product is of acceptable nutrient quality. Manufacturing: Our seven, well situated milling and mixing facilities incorporate automation and control systems which allow our excellent operators to precisely blend the right ingredients at the formulated inclusion level. Logistics: We have partnered with Barloworld Logistics to ensure that our feed is delivered to farm efficiently from our geographically well positioned feed mills, and that the bio-security and traceability chain is maintained throughout. On farm feed solutions: Our registered animal scientists provide on farm technical support to ensure that the right feed is Fed Right® for all stages of the animal’s lifecycle. Our promise: Meadow Feeds incorporates quality assurance systems and a comprehensive risk management approach to ensure the safety, integrity and traceability of our products. Our mills are ISO accredited as audited by the SABS. As members of the Animal Feed Manufacturers Association, whose mission is to ensure “Safe Feed for Safe Food”, we voluntarily comply with association’s code of conduct as audited by Afri-Compliance annually.